This morning at NAB in Las Vegas, Blackmagic Design launched the public beta of DaVinci Resolve 14. Performance sees a new playback engine that is up to 10 times faster than previous versions. Grant showed a 4-up multicam playing four streams of H.264 video at once with no problems. He said it works as smoothly on a notebook. Playback is now instant with J K L editing and live trimming to the current frame of the clip that is playing back. Audio is a full copy of Fairlight’s movie and TV audio postproduction software built into Resolve. Grant took a swipe at Avid’s ProTools by saying that Fairlight’s tools are designed specifically for post. Like Final Cut Pro X, you can edit audio at sub-frame resolution – down to the sample level. 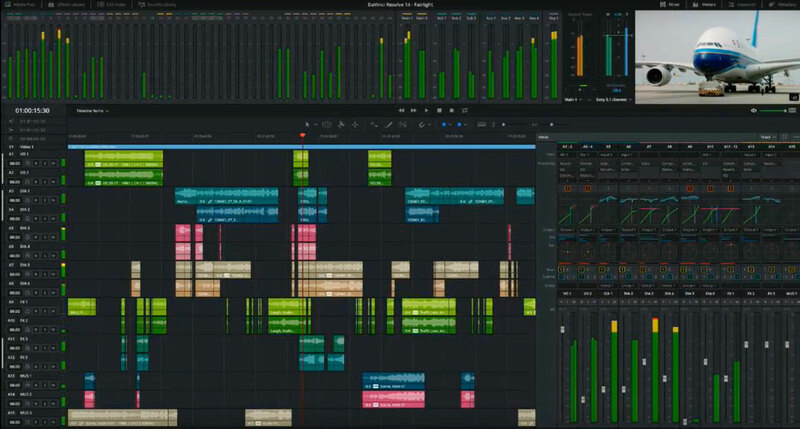 Collaboration means that if two people are working on the same timeline, the either person can load up the other version of the timeline and Resolve 14 will show the differences. They can then choose to accept or reject edit by edit. You can also use secure chat to connect to people via the local network or the internet. These chats can also be stored and kept with the project being discussed. 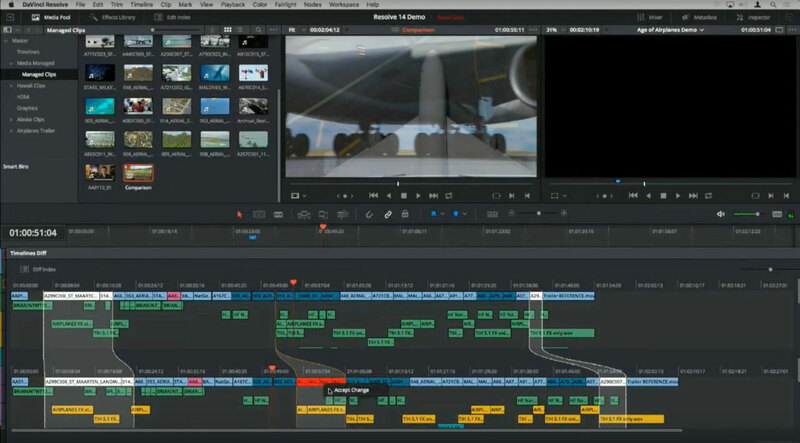 Other improvements include tools to make it easier for non-colourists to grade footage. 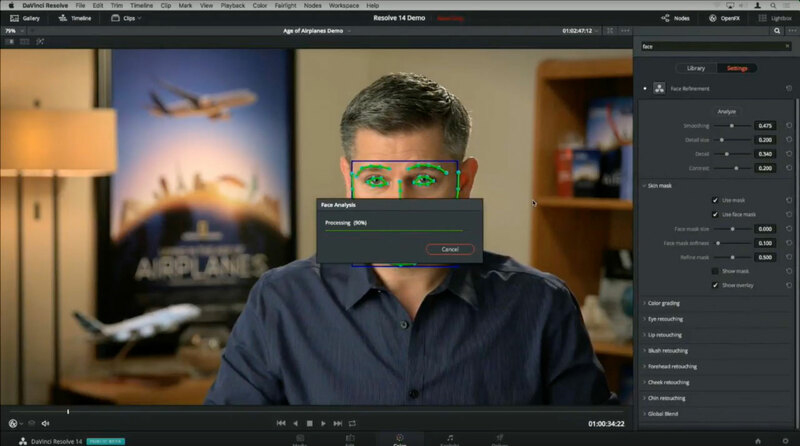 One tool can analyse footage to detect faces and then make changes to those faces using controls based on modifying on human features – such as changing the eyes, nose or mouth. Find out more about on editing in Resolve 14 in Blackmagic’s YouTube video. There are also YouTube videos on New Features and Colour. The price now matches Final Cut Pro X: $299 down from $999. Since Blackmagic released their first version of Resolve, they haven’t charged for upgrades. The open Beta is available for Mac and PC today from Blackmagic. Although it is called a Beta, Fairlight was only bought by Blackmagic 6 months ago, so the audio parts are more at the Alpha development stage. I would suggest that if you like editing with a track-based NLE, you should take a good look at Resolve 14. There’s a good chance it does much of what you can’t easily do at the moment and will improve faster than Avid or Adobe will be able to catch up.